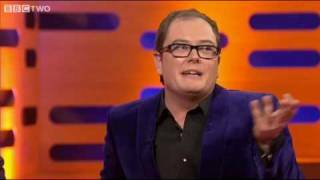 Alan Carr, the son of football manager Graham was born in Weymouth and grew up in Northampton and Blackpool. He studied drama and theatre studies at Middlesex University, after which he took on a series of dead-end jobs, from toilet cleaner to call-centre worker, before turning his hand to stand-up. In 2001, he won the BBC New Comedy Award and the following year made his solo Edinburgh debut, returning in 2003 and 2005, where he came to the attention of Channel 4 executives looking for new presenters for The Friday Night project. He has co-hosted the show (which later moved to Sundays) with Justin Lee Collins since 2006, and in 2008 landed his own Channel 4 game show, Alan Carr’s Celebrity Ding Dong. In 2007, he embarked on a major UK tour, Tooth Fairy Live, the DVD of which was a Christmas bestseller; and in 2008 his autobiography Look Who It Is! was published by HarperCollins. Described as 'the spiritual son of Frankie Howerd, Carr was named best live stand-up at the 2007 British Comedy Awards and best comedy entertainment performer the following year. He was named circuit comic of the year in the 2005 North West Comedy Awards and nominated for best theatre tour in the 2008 Chortle awards. Alan Carr: Look Who It Is! 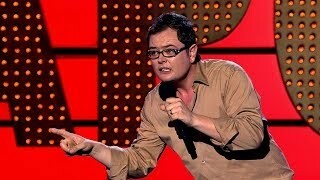 We do not currently hold contact details for Alan Carr's agent. If you are a comic or agent wanting your details to appear on Chortle, click here.